Launched in 1719 at Portmouth. In 1782 Royal William took part in the navy operations which led to Gibraltar’s liberation. Also in that same year, the ship was involved in the salvage attempt of Royal George, which overturned in Spithead causing the death of 900 persons. In the end it was assigned as anchor-watch at Portsmouth, until 1813 , then demolished. Its survival for almost a century compares strongly with the typical six-year life span of so many other ships. 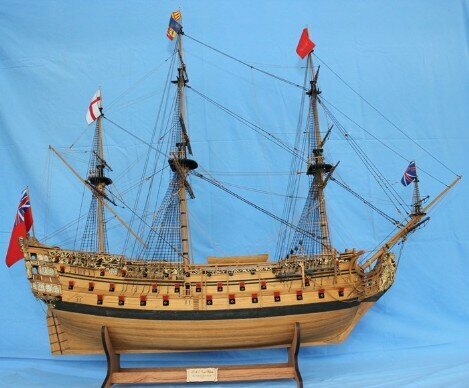 The following photos are an example of how a finished model of the Royal William can look.